The Health Tech Forum is an active, thriving epicenter for professionals interested in the development, distribution and utilization of advanced technologies to improve human health and the management thereof. It includes medical and monitoring devices, biotechnology, pharmaceuticals, health IT systems and all related software – remote or otherwise. The Health Tech Forum will bring the medical and technology communities together to discuss the issues, explore the applications, and drive new solutions that answer the challenges in the exciting field of health technology. The Heath Tech Forum brings together passionate professionals in all stages of health technology development, commercialization and use in North Texas, encouraging networking, development, knowledge creation, funding, partnership, growth and promotion of such technologies. Those who benefit the most from the Health Tech Forum include entrepreneurs, students, companies and funding sources that are actively engaged in the development, commercialization or use of health related products or services. Disciplines include but are not limited to scientists, medical professionals, engineering, software development, manufacturing, quality and assurance, regulatory, training and education, intellectual property, sales and marketing, human resources/recruiting, finance, and general management, as well as angel, venture capital and private equity funding sources. Using sensors for digital patient engagement- Maria Schneider, CEO and co-founder, Dynofit Inc.
click here to view Marc's presentation. click here to view Mark's presentation. 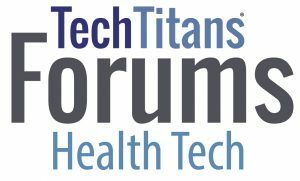 For Tech Titans Health Tech Forum leadership or sponsorship opportunities, please contact Paul Bendel, Senior Vice President or call 972-792-2854. For Tech Titans membership, please contact Drew Snow, VP member services or call 972-792-2855.